WE HAD A QUICK LOOK at the Mercedes-Benz 300 SL 1:24 scale Tamiya kit six months ago, and now here’s how we got on with building and finishing the model. 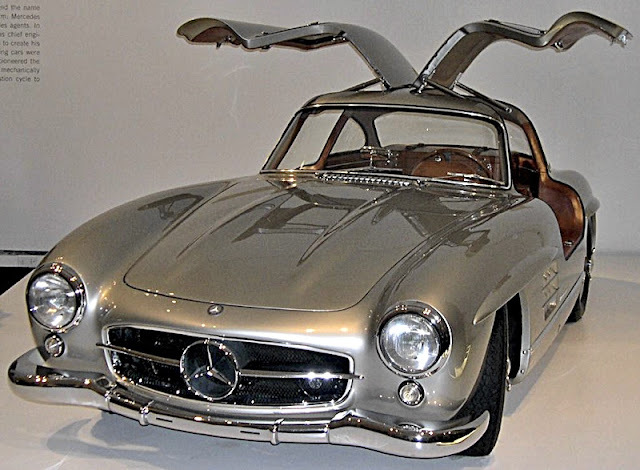 Mat Irvine: Tamiya’s presentation is always excellent, and the Mercedes-Benz 300SL is no exception. When I looked at the kit in February 2015 (click here to view) I realised the build would have to wait a month or three, as there was going to be plenty involved. But it was worth the wait, and here’s how I got on. Opening the box reveals 163 components (below). They are moulded in silver-grey, black, white, chrome and clear. There are also vinyl tyres, mesh for the grill, conventional water-slide decals, and metallized decals. Cutting the runners from the door openings (below). I found it best to use the small razor saw seen at bottom left. Sorting out the hinge arrangements (below) for the gull-wing doors. The lift-up components are crucial for the appearance of the finished model, so do take care with them. Fitting the doors into place (below). I have painted the interior in tan, so here it is masked off (above, below) to allow the exterior spray painting. I used silver, the German international auto racing colour. I used Testors German Silver for the bodywork (below), although Tamiya itself makes a similar shade, so choose as you you wish. In typical Tamiya fashion, the radiator grille is made from nylon mesh (below). The comprehensive instruction booklet supplies a pattern for you to cut out. Meanwhile I assembled the complex ‘birdcage’ chassis, complete with engine (above, below). 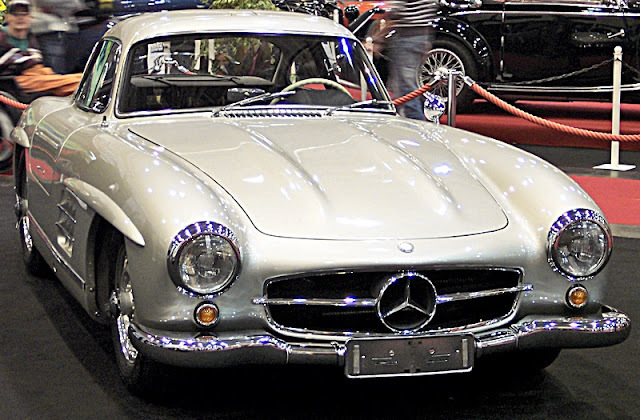 The original was an inline slanted design that allowed it to fit under the low bonnet. Tamiya has modelled this aspect of the power plant accurately. The firewall is fitted into place (below) between the interior and engine compartments. I finished the interior compartment (below) in red, one of the standard colours fitted to the real thing. 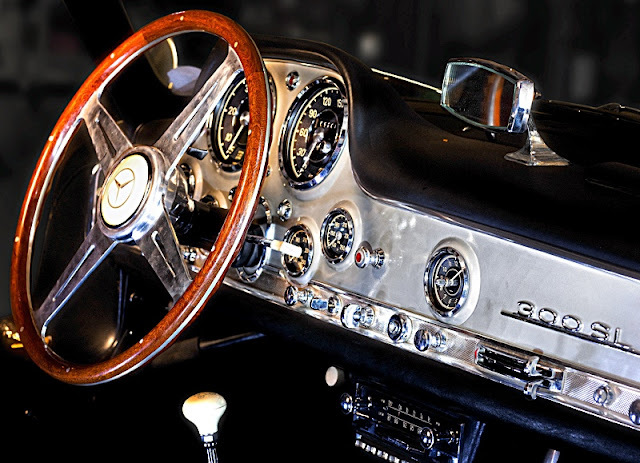 The white steering wheel is a classic 300 SL touch. The instrument panel and steering wheel (below) fitted in place. The three main sub-assemblies (below) are the body, interior, and chassis. The next step is to bring them all together, to create the complete vehicle. Here is the finished result (four pix below). The gull-wing doors can be placed in closed or raised position, complete with the four hydraulic struts that hold them in place. Reference pictures are always useful when finishing a model. I took the pictures (four pix below) of a full size MB 300 SL that is on display at the The House on the Rock, a resort attraction in Wisconsin, USA. More useful reference pictures (below).